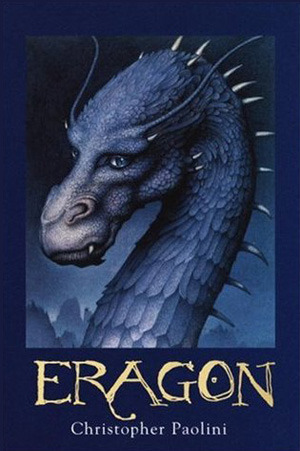 I bought Eragon when it was just released, just because it had a dragon on the cover and I loved dragons in that time. But I immediately fell in love with it when I finished it. My love for these books has died down over the years, but I still think The Inheritance Cycle is a very good series. I give The Inheritance Cycle by Christopher Paolini four (actually three and a half) out of five hearts. Eragon I loved so much, each time I read it makes me fall in love with the series all over again. It is a very strong beginning to a great series. But I am sad that the series literally goes down from there. Looking at my scores for each of the four novels, I gave each following novel a heart less. Which gave me a total of 3,5 hearts in total. At the start of each book, I remembered what I thought of it last time I read it. My opinion mostly just got adjusted downwards throughout the series. Half way through the Brisingr I got so bored with it I stopped reading it for days on end. I just could not make myself read more. So I finished a couple of novel in between. And starting Inheritance I pushed off even more. Eragon is a strong boy, but he stays a boy. He does not grow up that much. When a big fact about his inheritance is revealed by Murtagh during Eldest, he keeps wallowing in the issue until others proof otherwise. I liked Murtagh from the moment he joined Eragon in his travels and everything else that happens afterwards. I only thought he was a bit whiny about the fact that Eragon accidently got him caught up with the Varden, but lets go of that soon. Oromir and Glaedr are a bit of an annoyance to me. They do not want to fight, but Christopher Paolini doesn’t really explain why, we only get information and have to make assumptions from there. When he finally dies I wondered how it is he did not die earlier in the books, when training with Eragon. After having killed the Shade Durza, Eragon blesses Elva, but due to having too little knowledge mostly just curses the girl. The girl becomes pretty whiny and I wonder why she was put in there. Yes she saves the lives of a couple of people. But not in the moments that really counts, like when the one eyed assassin tries to kill Roran. The further I got into the novels, I had more parts where I just got bored or just did not like it. I which Christopher had put more things that were useful in it. The end of the series was also very unsatisfying. Usually there is too little information after the big-end has happened. But here there was way too much info. Literally almost 10% of the novel is dedicated to what happened after killing Galbatorix. Also not a good choice. Christopher Paolini says he is working on a fifth book, with some new and some old characters. I do not think I would read it, because I do not feel like I want more information on the world of Alagaesia. Actually I do not want to discuss this movie. But here goes. Back in the early 2000’s I was so happy when they announce Eragon was going to be turned into a movie and with such great actors too! Jeremy Irons, Robert Carlyle and John Malkovich pulled me into watching it. But it was such a bummer, it made me reread the first novel just to fact check that they really messed so much up in it that making Eldest as a movie would completely not work out anymore. The backgrounds were really great, but I thought Saphira was not well done and most of the acting was still. This entry was posted in Book Review and tagged Adventure, Book Review, Christopher Paolini, Fantasy, Movie, Romance. Bookmark the permalink.